YODA is one of the most impressive individuals in the sale offering in terms of both phenotype and data. He is massive with an immense degree of thickness and muscle when viewed from any angle. He combines a birth weight of 78 pounds with an adjusted 205 day weight of 702, giving him a birth ratio of 89 and weaning ratio of 111. His outstanding weaning performance has only accelerated on test. 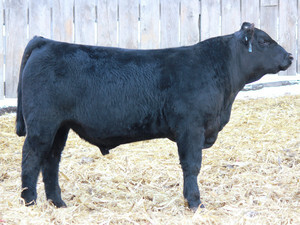 His Angus sire is a son of TC TOTAL who produced outstanding performance for us throughout his first calf crop. YODA is an outstanding prospect to produce light birth weight cattle that will grow and excel throughout their productive lives.